1. 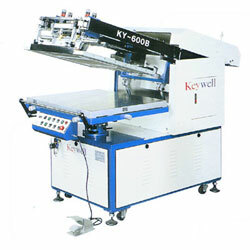 Suitable for flat-surfaced screen printing on substrate in film/sheet/board form made of non-deforming materials. 2. Applied to the frame up / down and printing stroke is the advanced electric transmission system, Micro-adjustment knobs for X/Y registration, easy to operate. 1. Max. print area: 600x800 m/m. 2. Max. frame size: 880x1100m/m. 3. Substrate thickness: 0~40 m/m. 4. Dimension (cm): 176x100x130. 5. Weight: 630 kgs.